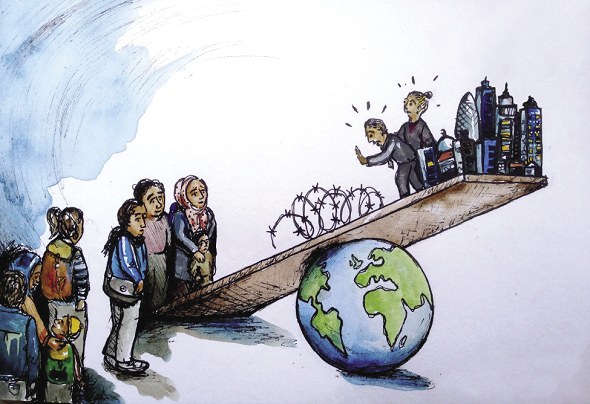 Global inequality is the reason why we worry about migrants, says Bridget Anderson. The police are controlling migrants in Macedonia and Calais, migrants are losing their lives in lorries, migrants are drowning at sea and migrants are shot at borders. People tell us that these are signs of a global problem. But the problem is not only in the Mediterranean and the Balkans. There are the Rohingya left in the Andaman Sea in May last year, and there are the growing number of refugee camps in Jordan and Lebanon, the detention centres on the Pacific island of Nauru, refugee boats pushed away in Australia, and deaths in the Sahara desert. Migration is a big problem. Across the world, countries are building walls and making stricter immigration and asylum laws. There is more violence and there are more deaths at borders. But if we look at history, we see that migration is not only a problem that we have now. For thousands of years people have moved around the world for trade, exploration, colonialism, to marry, to make war, to change religion, or to find resources. And rulers have always wanted to control where their people can go. The first immigration controls were near the end of the 19th century, but we can see controls earlier in history. In 1388, a worker in England moved from where he lived. He had to carry a letter like a passport from the king. In the 15th century, these ‘passports’ were detailed documents and you could buy false papers for between two and four pennies. People have always moved but they have not always ‘migrated’. The growth of nation-states in the world has changed the idea of people moving into the idea of people migrating. This growth started from just after the Second World War. Across the world, migration continues to change. Global capital, finance, and new technology are more difficult for governments to control. But we often think international borders are natural and fixed. Strong control over immigration comes from a desire for a national labour market and economy, a stable society, and democratic politics. The idea of migrants is an example of the way things can change in the relations between nations, people, and state. In politics, migrants are a sign of less state power and sometimes politicians not thinking about everyday problems. Transatlantic Trends does a survey every year of the European Union (EU), US, Russia and Turkey. It always finds people are against immigration. But who are the migrants that people worry about? Moving from place to place is not always the same for all people. Some movement is forced and some is stopped and some is encouraged. Not everyone who moves across an international border is a migrant, for example, students, backpackers, au pairs, and British people living in Spain. People do not think a US banker working in Sydney or a British footballer in New York is a migrant. But people think foreign domestic workers are migrants. So migrants represent the poor and the desperate. The fear of migrants is, in part, the fear that there is not enough for us and for them. This fear is very real. It is easy to understand in a more and more unequal world. We are living at a time of the greatest inequality when the poorest 50 per cent of the world have 6.6 per cent of total income. The World Bank says that three-quarters of income inequality is because of differences between countries. So migration is not surprising when money and opportunity depend on where you are born. It is because of problems from colonial history that have led to civil war, violence, and economic systems that make the lives of many people in the world impossible. Rich countries see migration as a problem but for migrants it is a solution. For migrants, the problem is the border. Borders are a problem for people when they are inside their new country, when they cannot have work, or cannot go to hospitals, or cannot go to school or university, or cannot have houses. People are checked for their residence and to make sure that they have not broken their conditions of entry. More and more the responsibility for these borders is with citizens – employers, lorry drivers, and public servants. Take, for example, the use of immigration controls to ‘protect’ jobs. In early 2004, researchers from Oxford research institute COMPAS and the University of Sussex interviewed the employers of Polish farm workers. Before the EU grew in May 2004, many of these workers were on visas, and employers were very happy with how hard they worked and they often said that British workers were lazy and preferred to live on benefits. In 2005, when Polish workers had the same rights as British workers, the employers complained that Polish people had lost their culture, and were the same as the British. The National Farmers’ Union told Parliament they needed migrants who were on permits, who they could be sure would stay in the fields at harvest time. People often think that immigration laws are a way to stop workers who are not suitable, but they can also be a way to make differences. Immigration controls can make big problems for migrants. They affect employment and living conditions and their personal lives, especially for those who may be deported. Citizens of a country can also have these problems. US Law Professor Jacqueline Stevens found that about 20,000 US citizens were detained or deported as aliens between 2003 and 2010. She found that the group of illegally deported US citizens were mostly black, with little education, and often with mental-health difficulties. Often citizens are affected by immigration controls when their parents, children, and loved ones are taken from them by immigration controls such as detention or deportation – or when they are stopped from living with them by immigration laws. For example, in most EU states it is now necessary to earn over a certain income before a partner can join you. Fears about immigration can be a problem not only for migrants but also citizens. In Hungary it is now possible for state officers to go into any home where they think people are looking after a migrant. And most countries punish citizens who look after or employ undocumented workers. But there are changes. We are seeing more evidence of the differences between human rights and deaths at borders and between democracy and document checks and how they cannot continue. In Melbourne in August 2015 the Australian Border Force planned to check visas on the streets. There was a big public demonstration and the plans were stopped. In Europe, the ‘Refugees Welcome’ protests meant that some states, such as Britain, had to be more open to Syrian refugees. Trade unions around the world are accepting members and not worrying if they are migrants or not. Doctors in Spain are refusing to check their patients’ documents. Some social services departments are offering help to all children, not only those whose parents have papers. All this means it is possible to make a world where justice and equality does not depend on borders even in very difficult situations. Bridget Anderson is Professor of Migration and Citizenship and Research Director at The Centre on Migration, Policy and Society (COMPAS). This page was last edited on 6 February 2016, at 17:45. This page has been accessed 1,224 times.